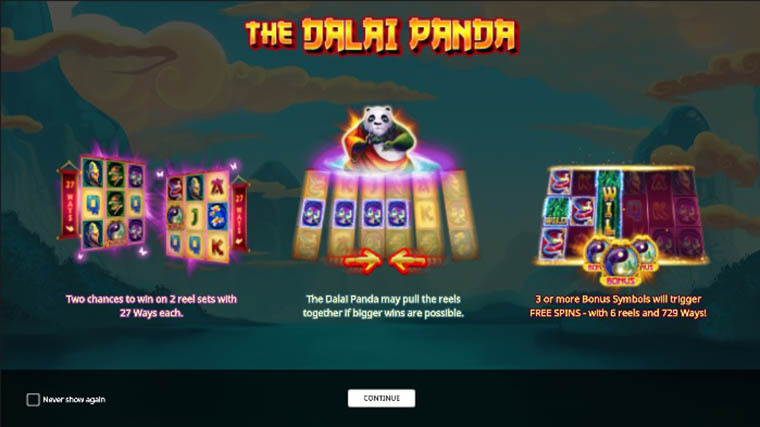 The Dalai Panda by iSoftBet is a lovely video slot that makes a combination between the Asian culture, giant panda as well as the beloved spiritual guru the Dalai Lama. The game has two individual reels of 3×3 which are separated down the middle by the Dalai Panda. Sometimes he will disappear and merge the reels together to help you form winning combos. The slot has 27 ways to win on which set of reels but when the panda merges them you get 729 ways to win. When you get a win on both sets of reels in the same spin you add one spin to the free spins bank. The free spins will accumulate there until you get three or more bonus symbols and trigger the feature. The Dalai Lama will then get you extra wilds, extended wilds and a 7x multiplier. Symbols: yin and yang, bamboo wild, paradise bird, monkey, turtles, love birds, koi fish, A, K, Q, J. Why play it: The theme is glorious, and the design is outstanding, but the fact that you can merge separate reels and get 729 ways to win a whole lot of free spins with added features is what makes it a must-play.